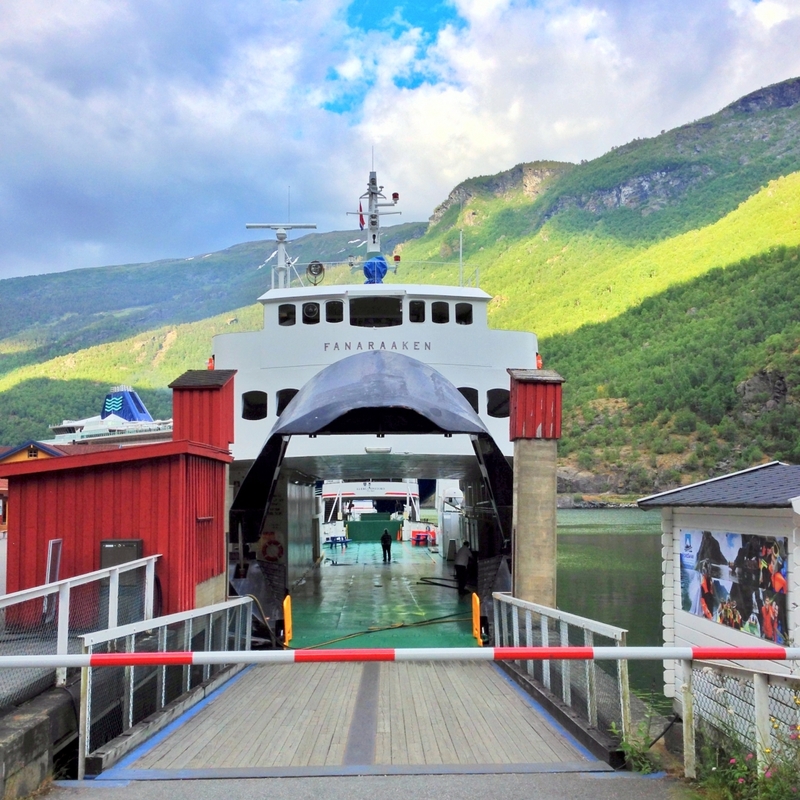 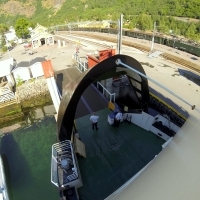 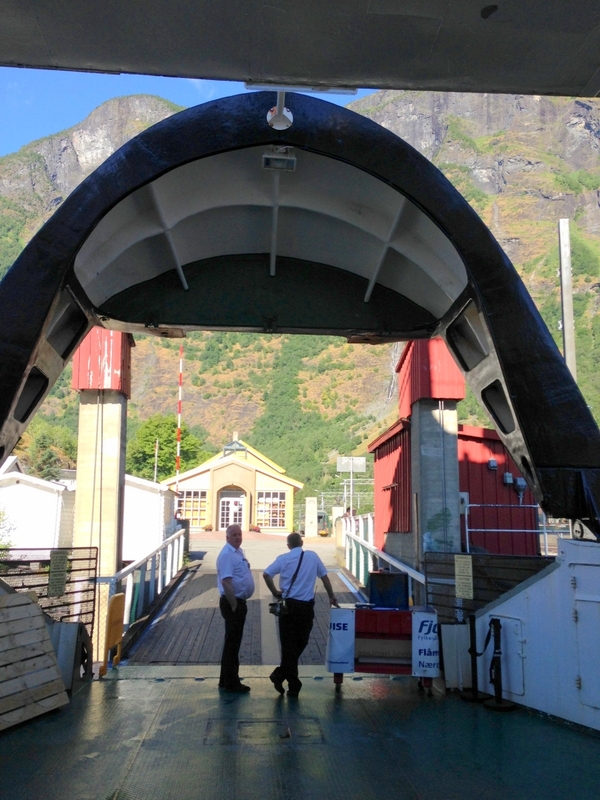 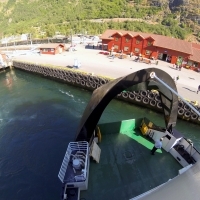 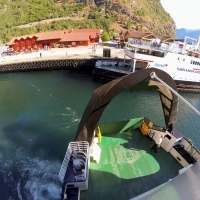 The ferry’s bow was hinged open for cars and trucks and people to board. 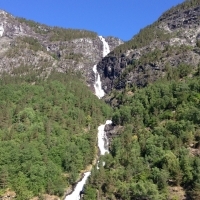 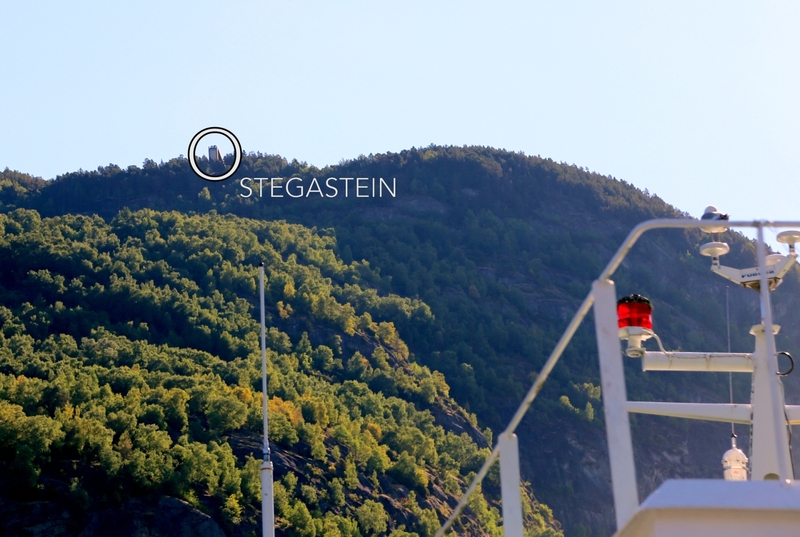 Shortly after we left Aurland, we passed under Stegastein which we had seen the day before on our tour over the Snow Road. 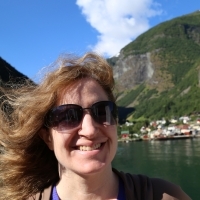 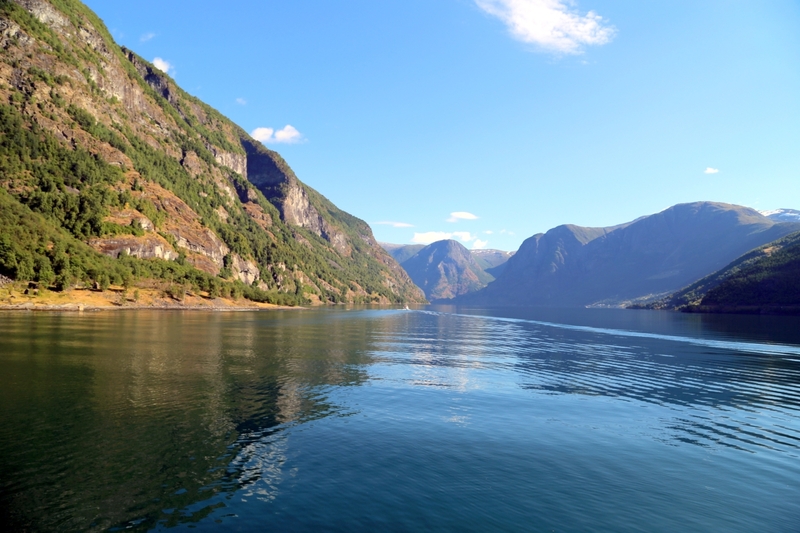 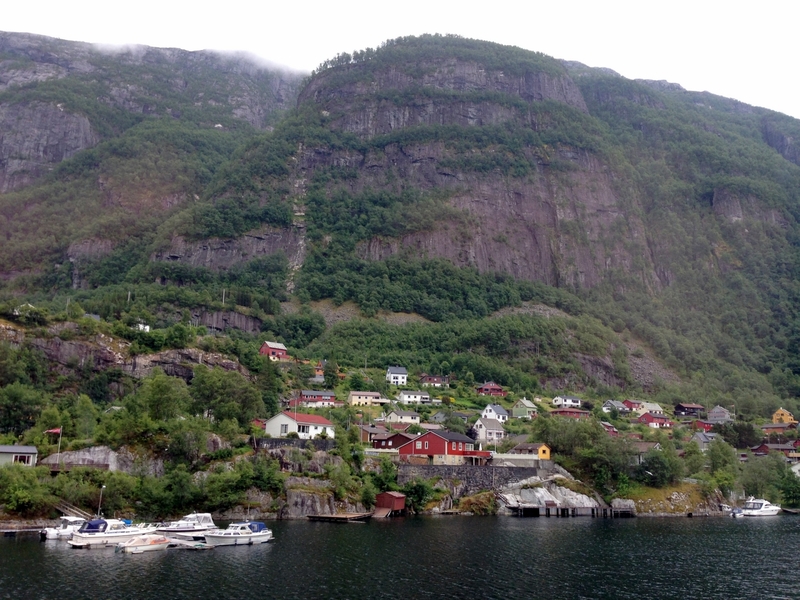 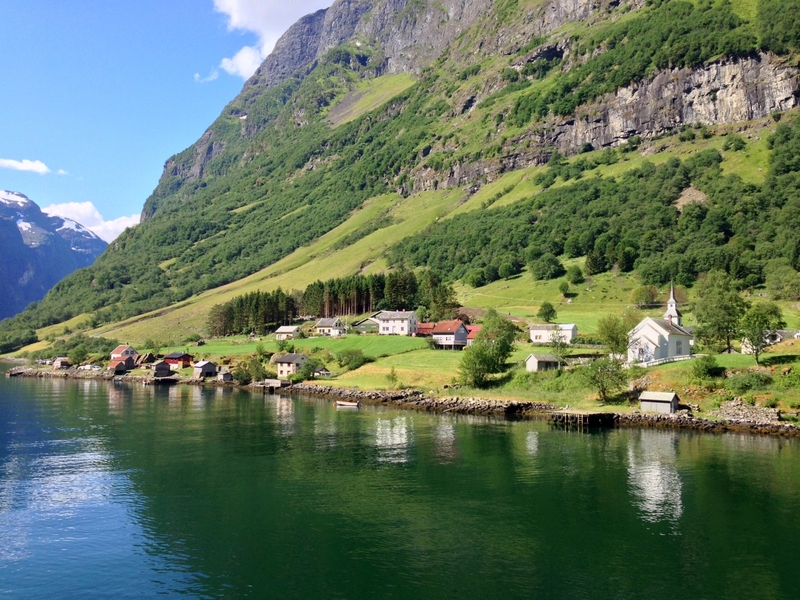 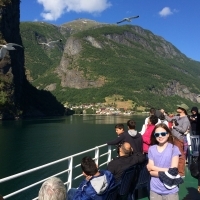 Around the next bend was our second stop: the tiny town of Undredal, tucked at the base of the fjord wall. 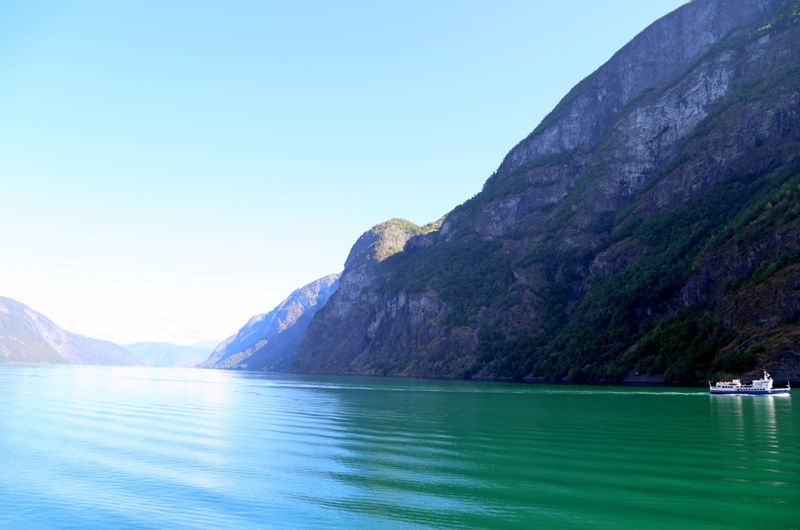 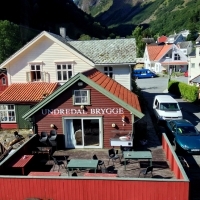 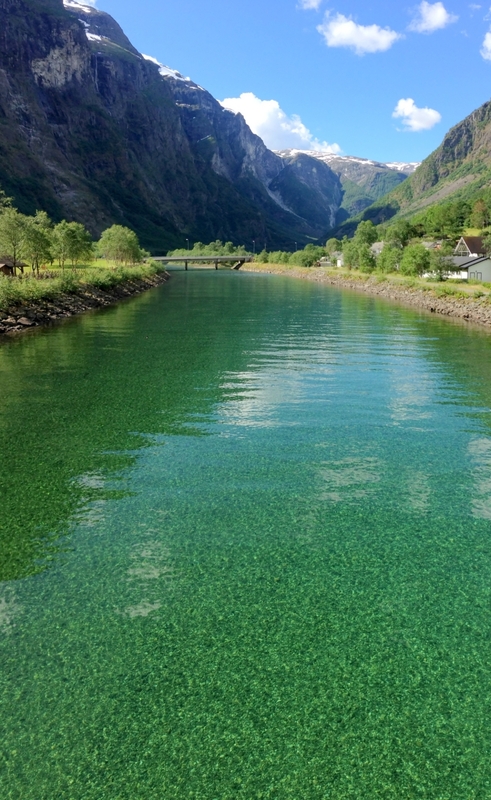 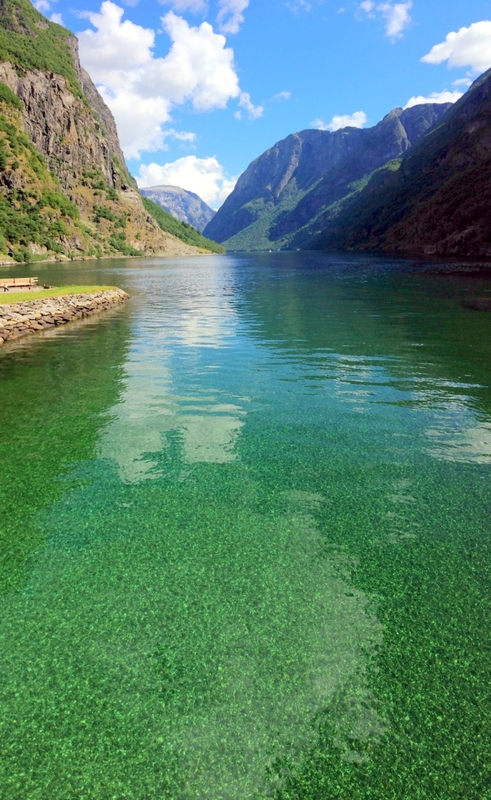 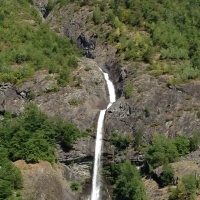 Prior to 1988, Undredal was only accessible by boat. 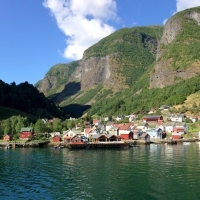 This tiny town is home to another stave church that dates back to 1147AD. 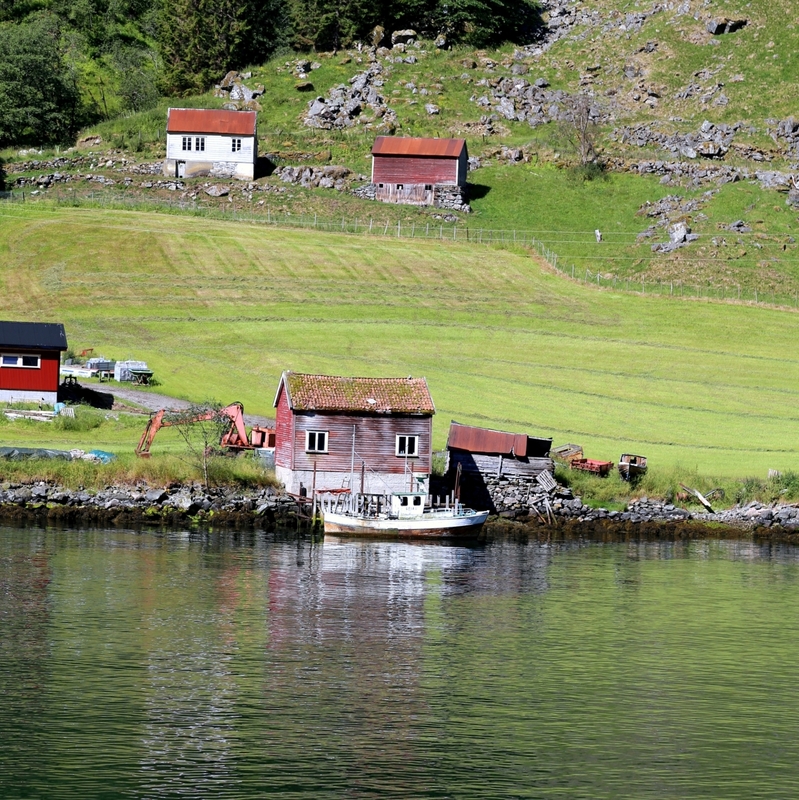 The white church with its red steeple can be seen in the third photo, to the left of the big red barn structure. 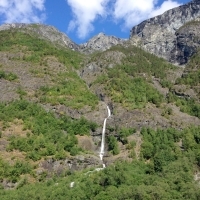 There was a new sight around every bend, and waterfalls were plentiful, the result of melting glaciers on the top of the fjord walls. 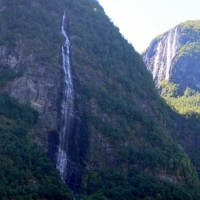 More waterfalls and high cliffs of rock soared above us. 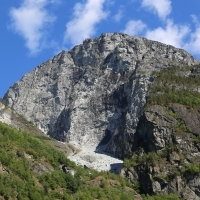 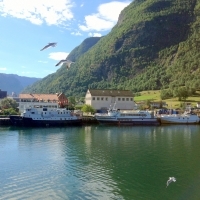 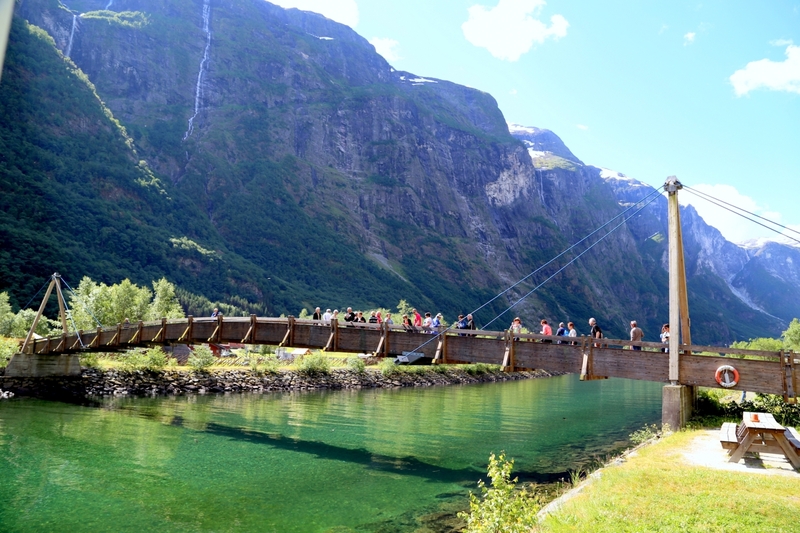 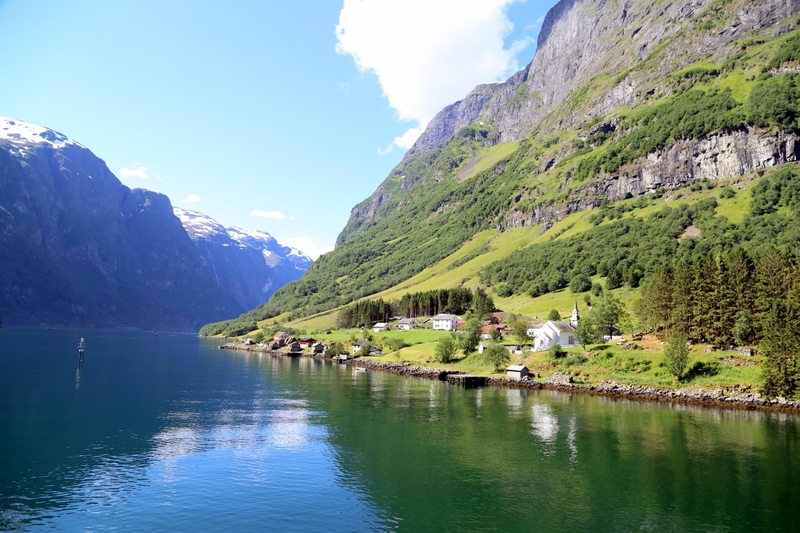 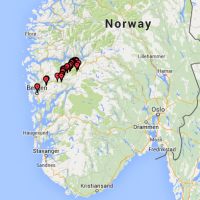 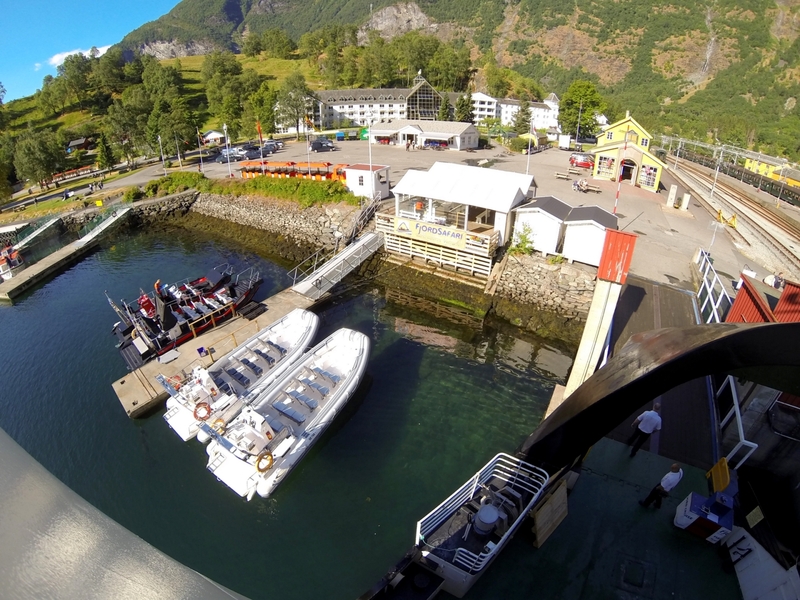 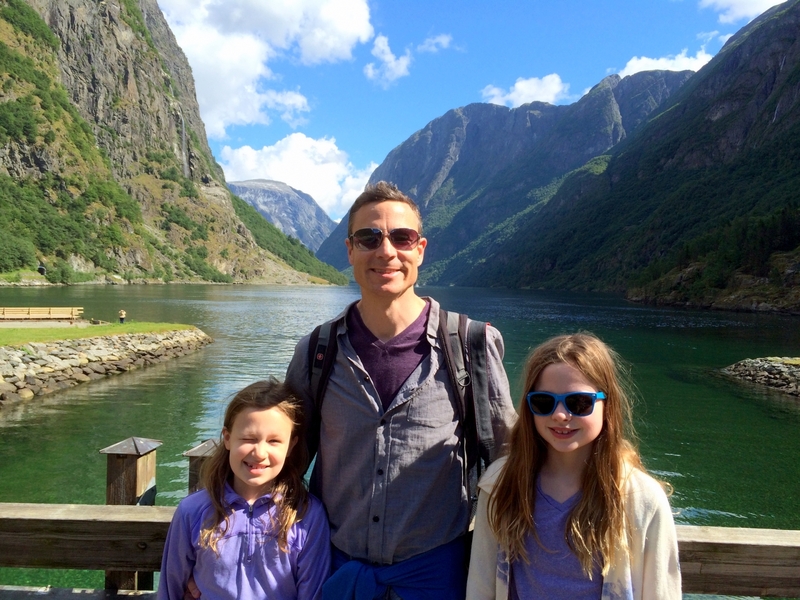 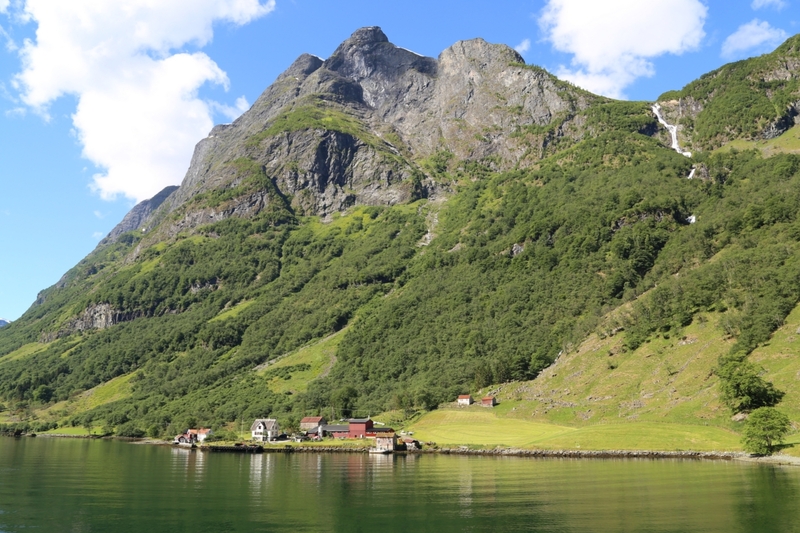 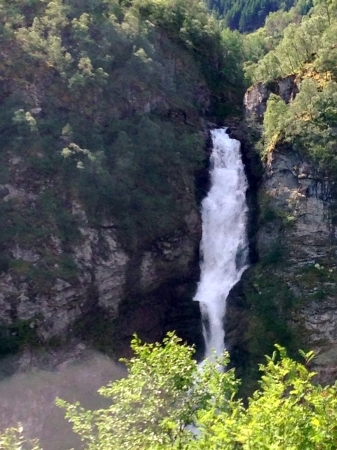 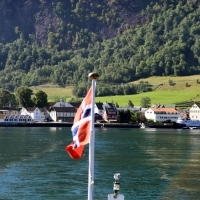 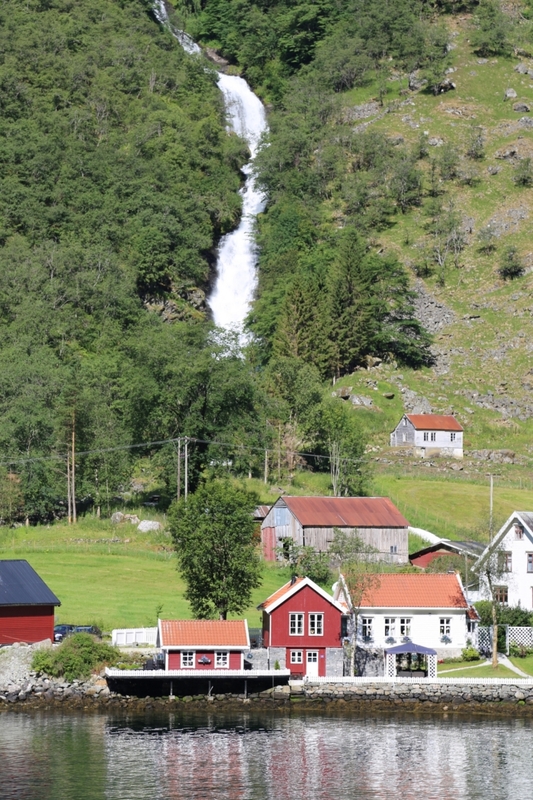 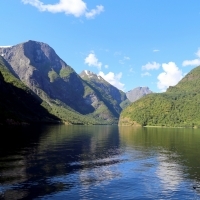 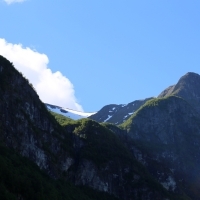 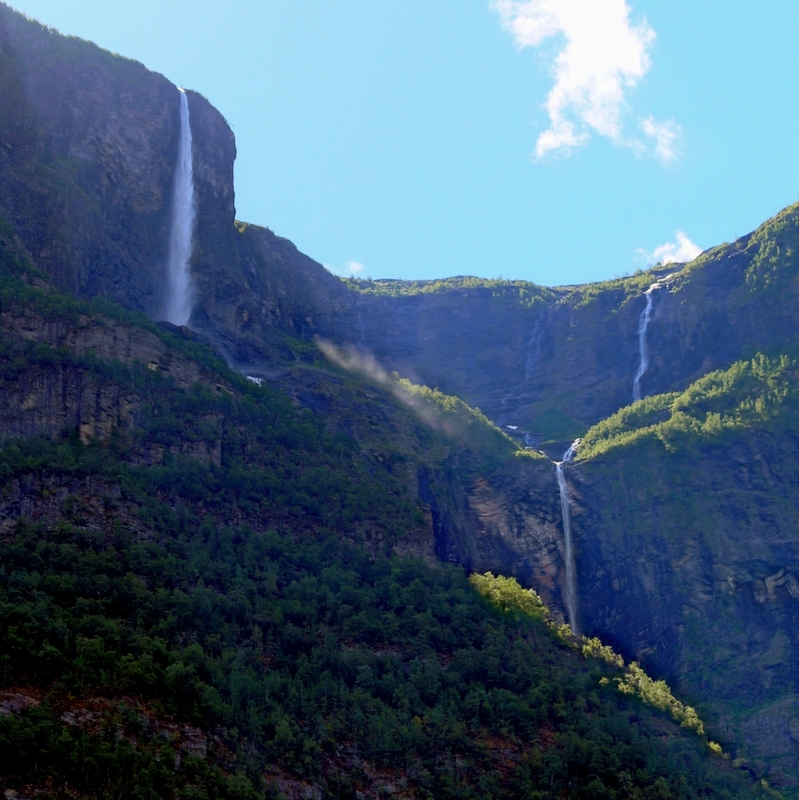 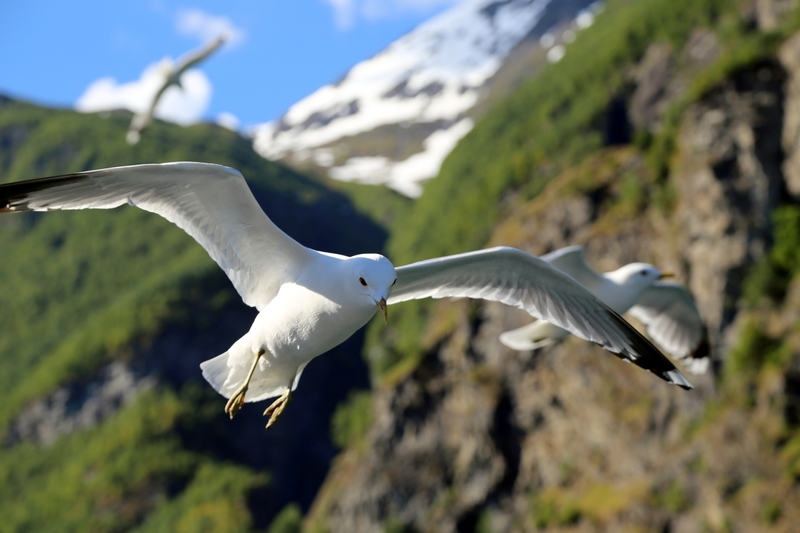 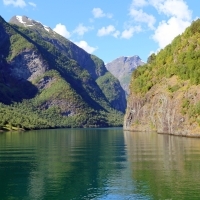 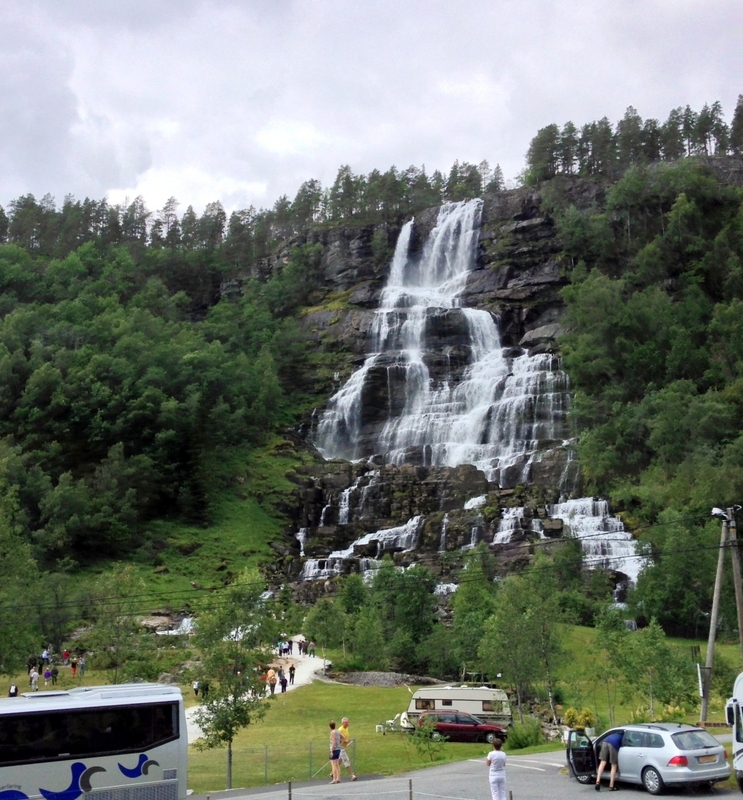 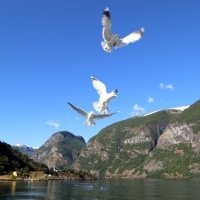 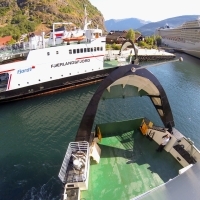 Gudvangen is an even smaller town than Flåm, sporting a small lodge and a gift shop. 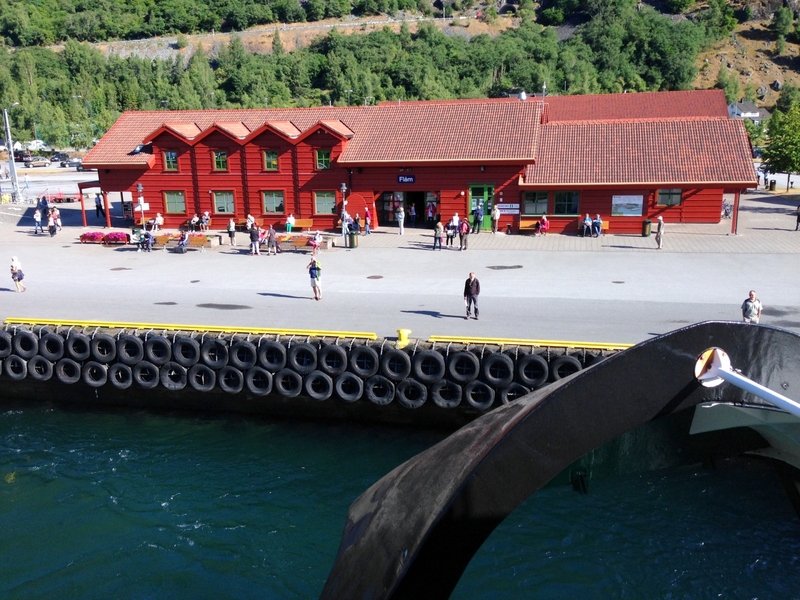 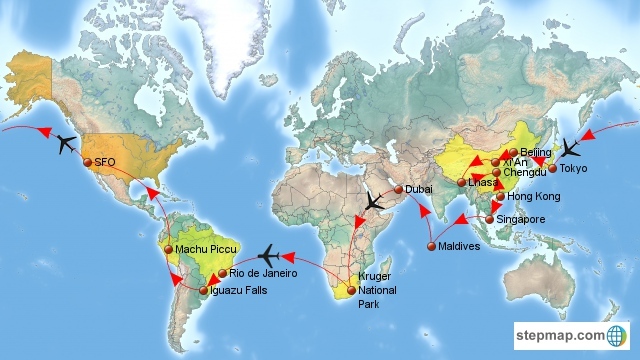 It’s also home to a ferry terminal (dock) and parking for lots of buses. 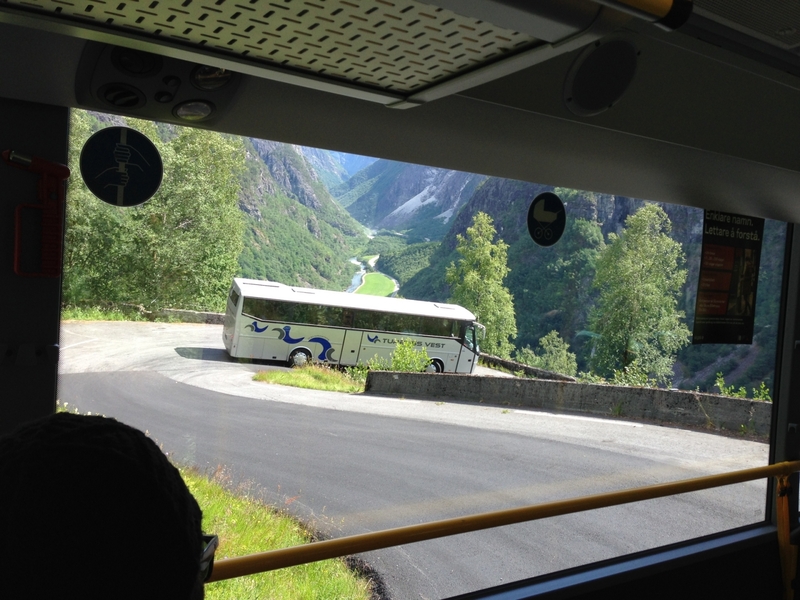 The bus to Voss headed out of the Gudvangen valley, through a tunnel, and started up a hill to the Stalheim Hotel at the top where we picked up some passengers. 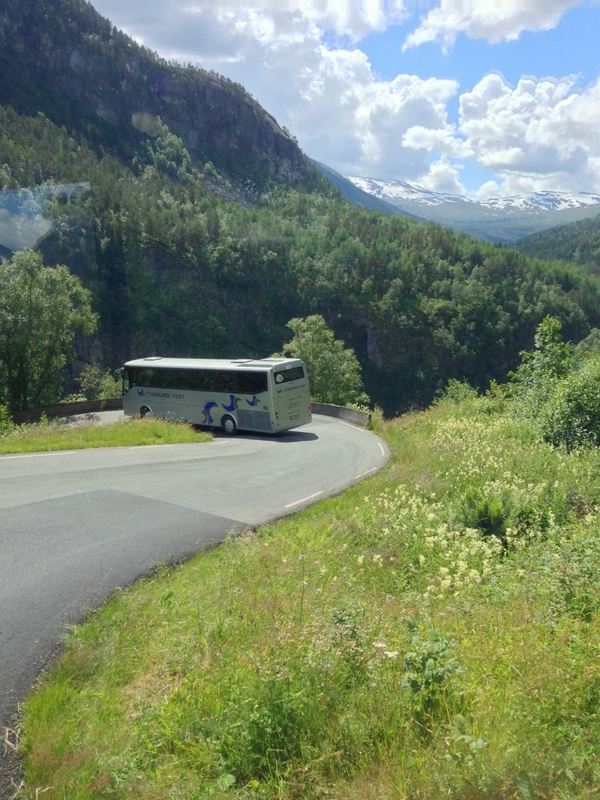 Then we continued down a Lombard-like supersonic s-curvalicious set of switchbacks with 80% grade (2 meters difference in height between the front and back of the bus). 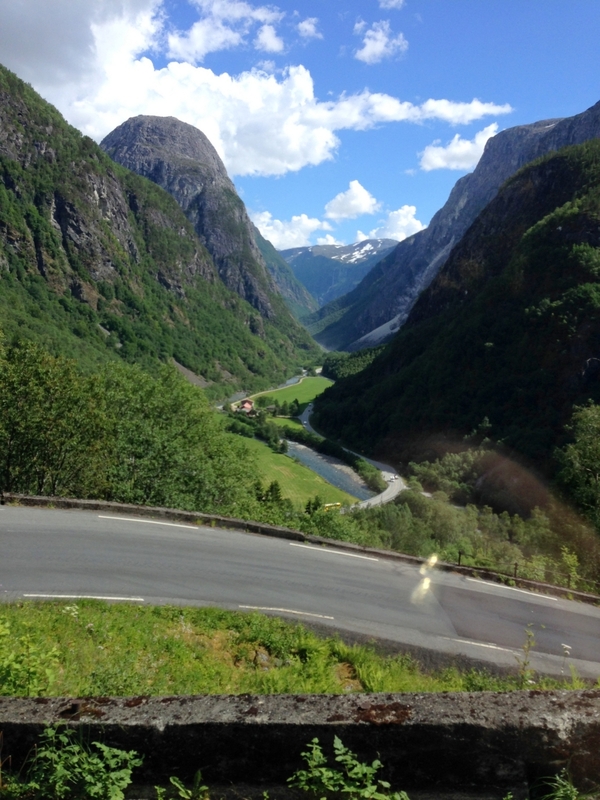 Once back on the valley floor, the rest of the bus ride was pretty, but not as exciting as the twisty-turny descent. 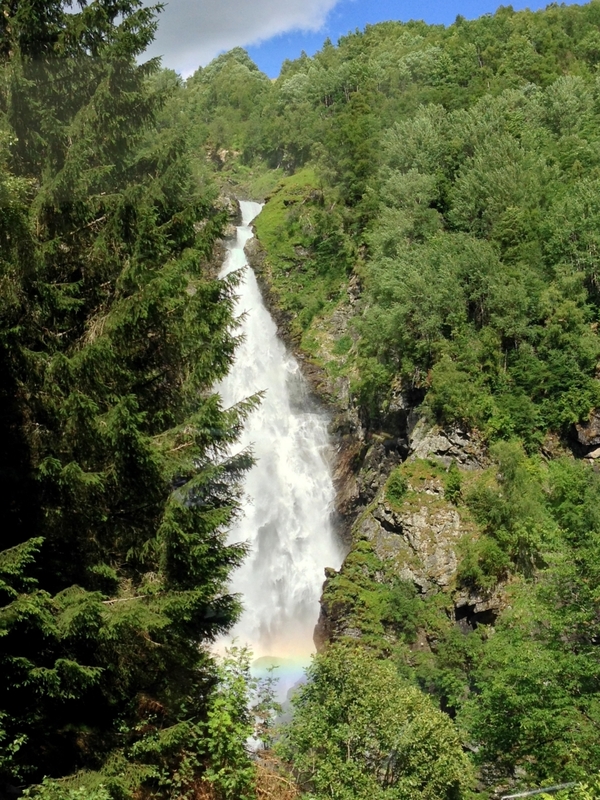 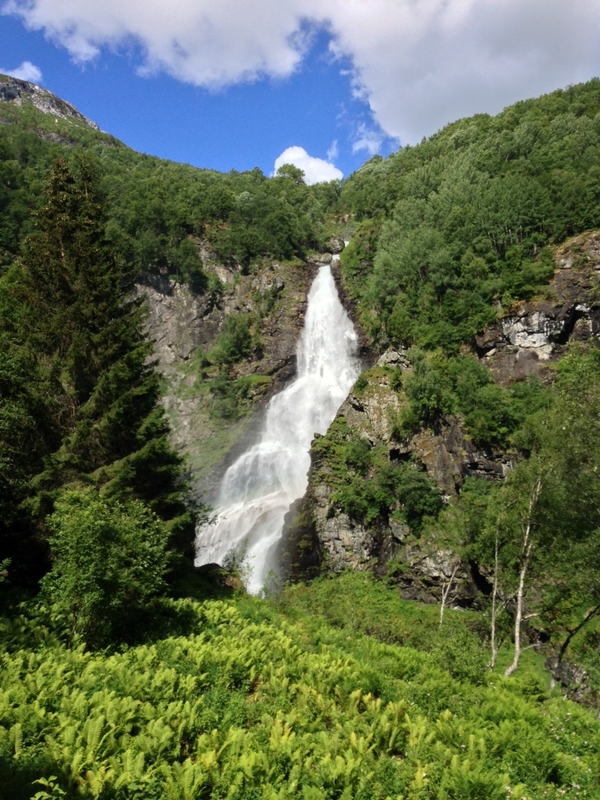 We passed one more stair stepping waterfall, but we didn’t stop. 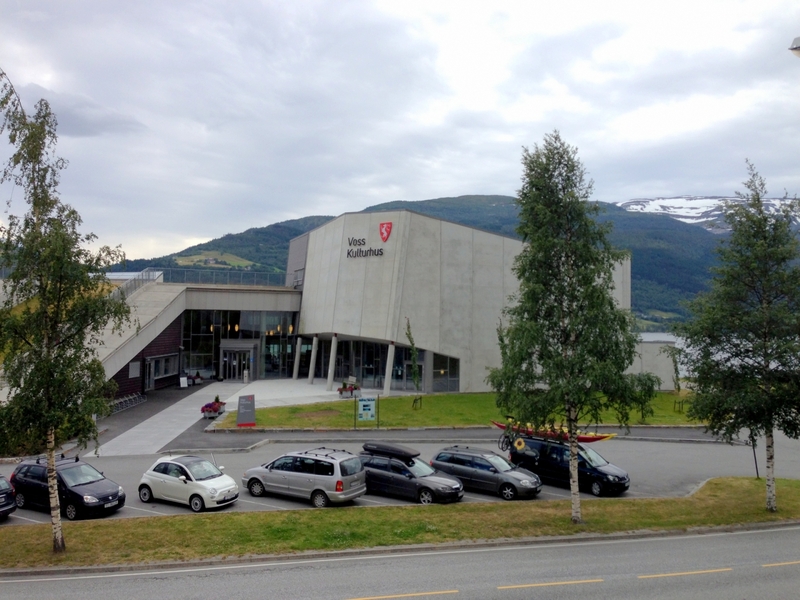 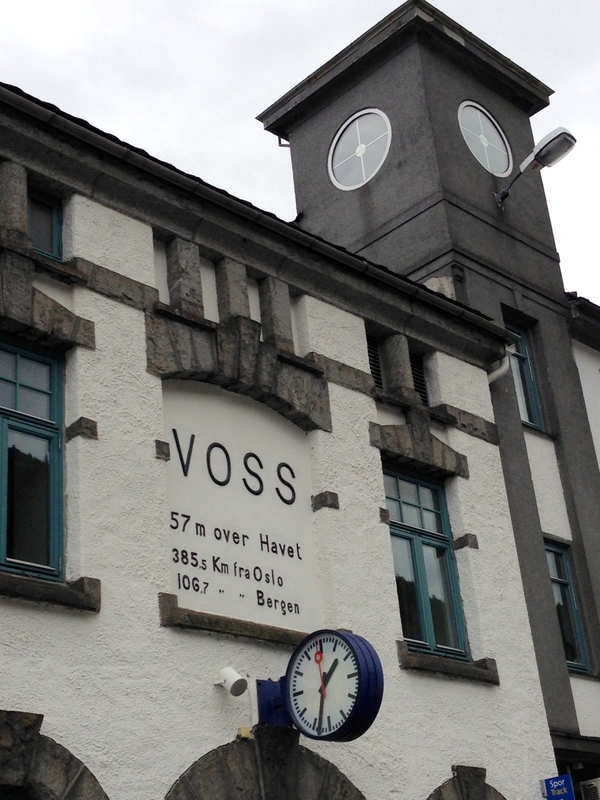 We arrived in Voss where we were meeting a train to take us to Bergen. 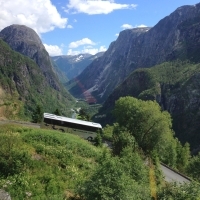 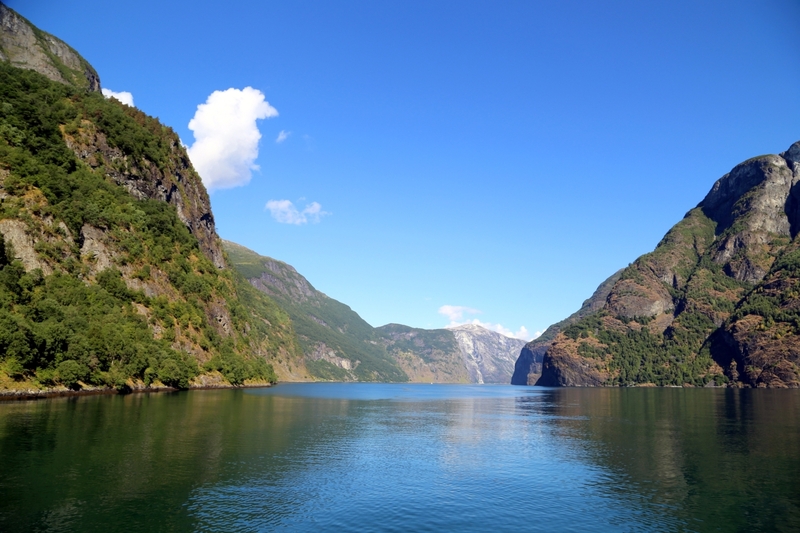 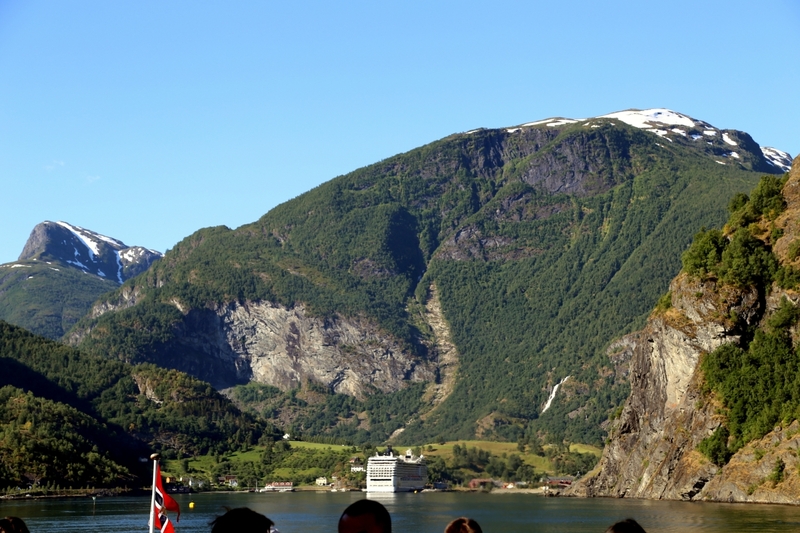 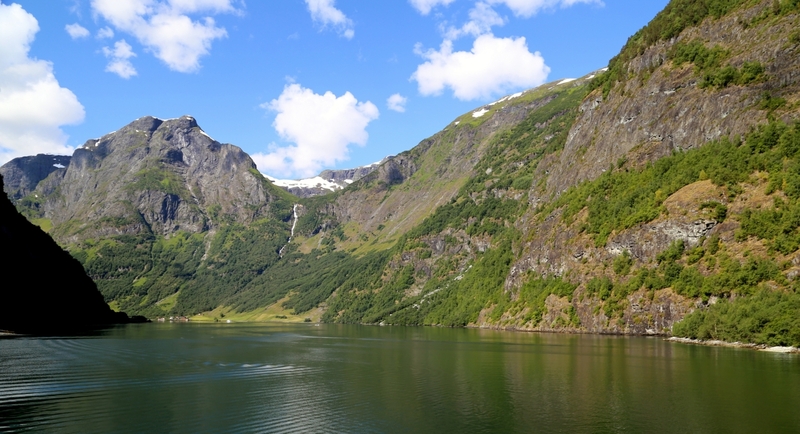 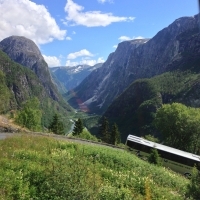 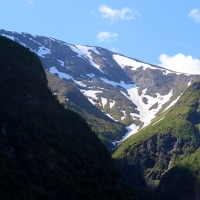 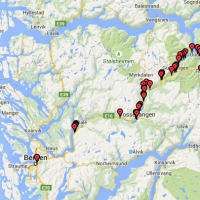 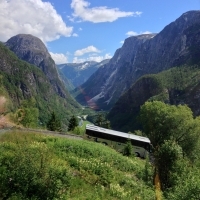 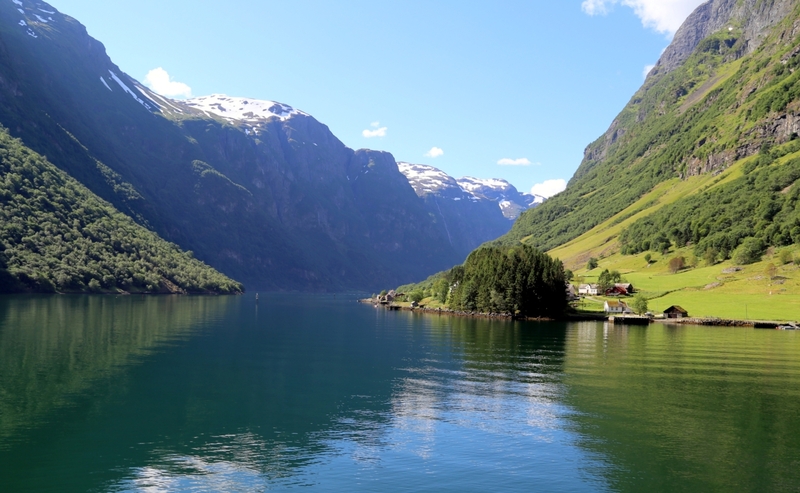 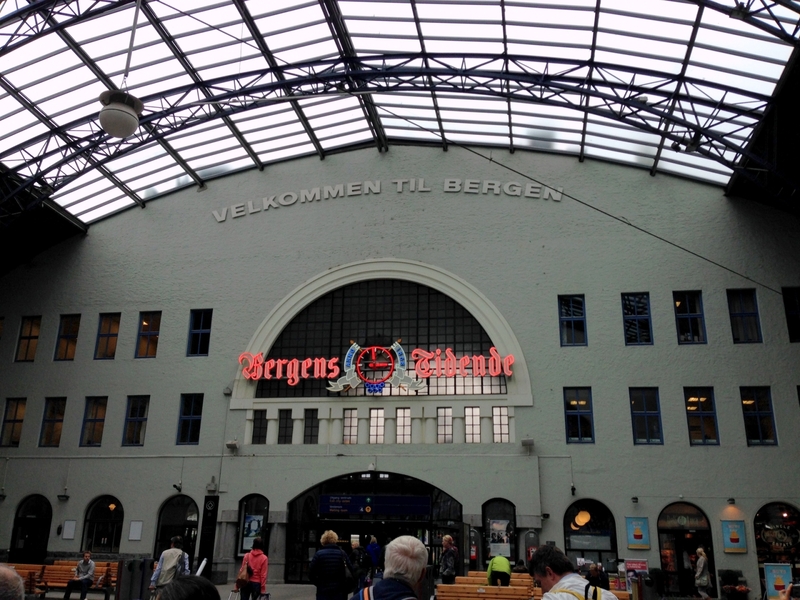 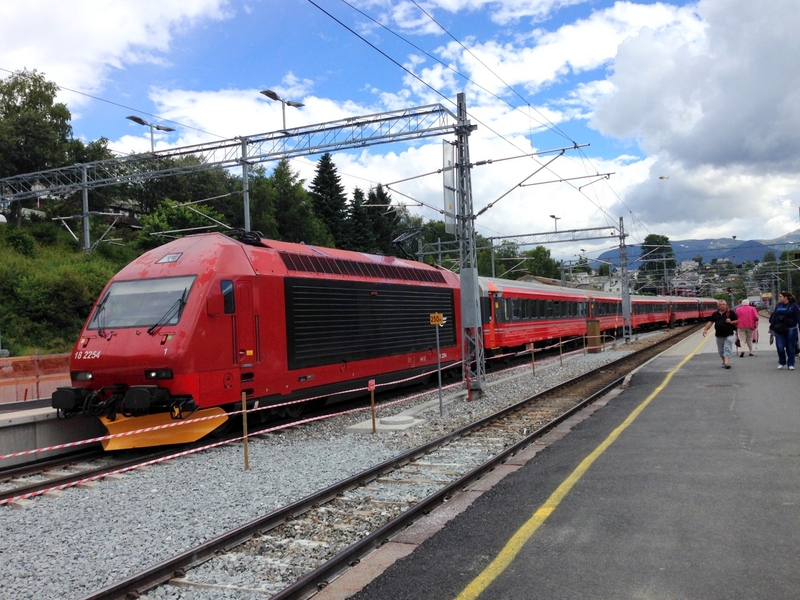 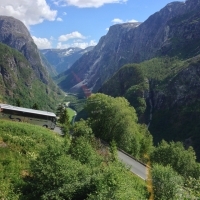 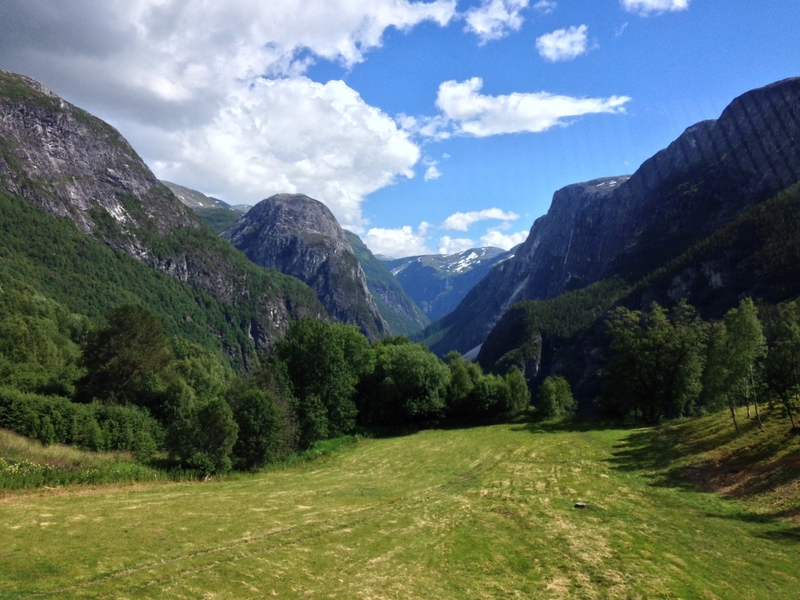 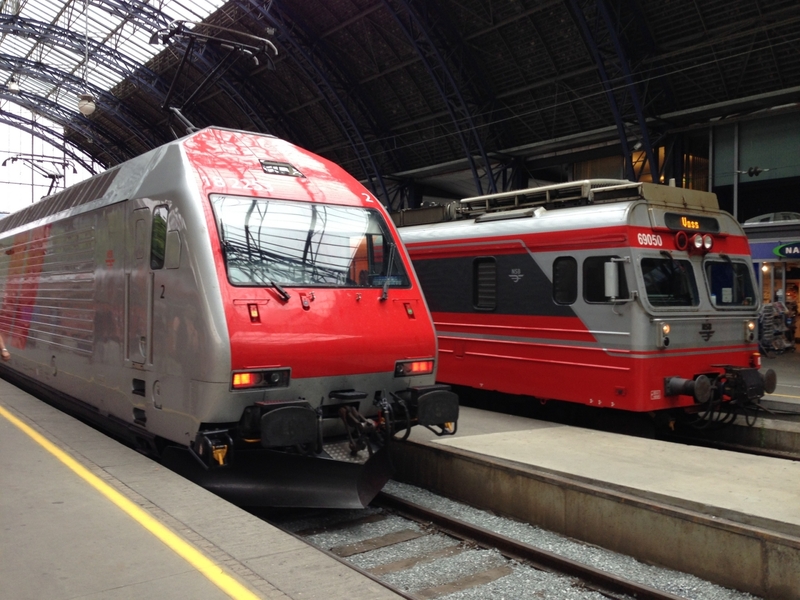 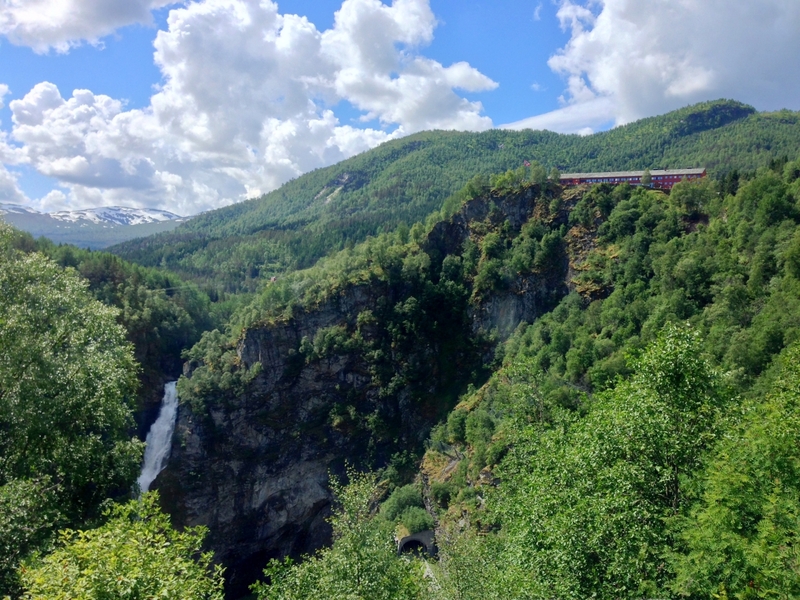 We once again rejoined the Bergen Railway – the same line we took from Oslo to Myrdal – in Voss for its last leg to Bergen. 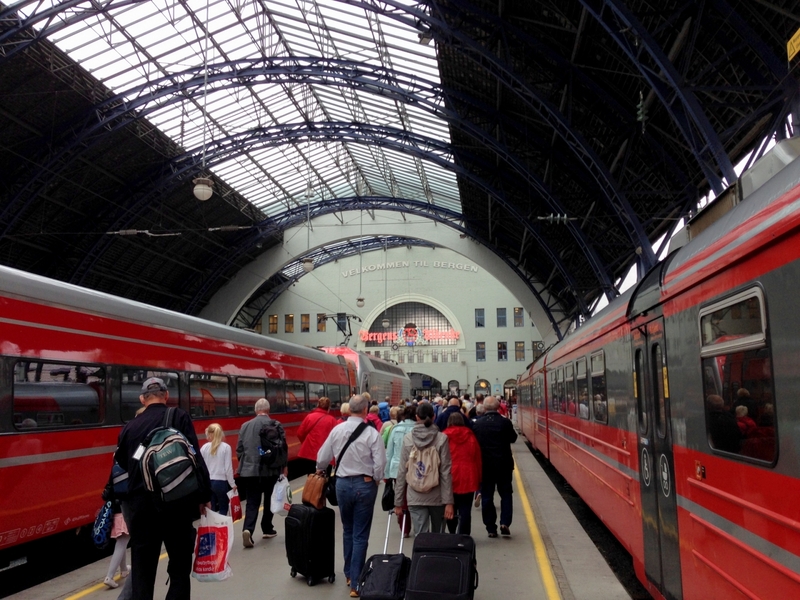 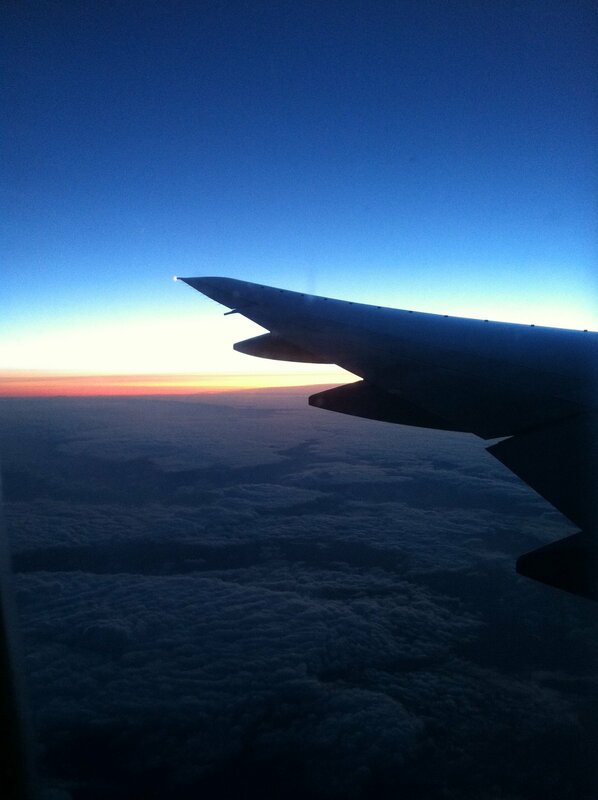 It was only about an hour, but nice to be back on the train. 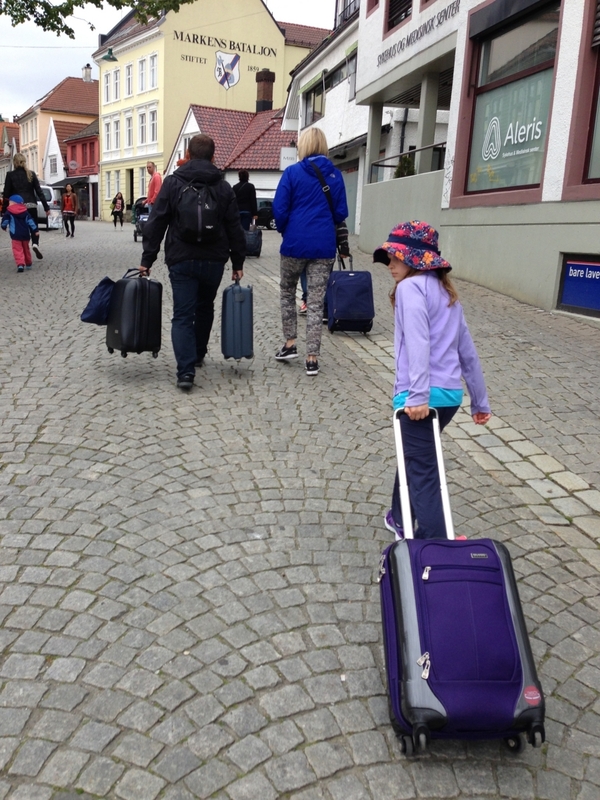 The walk to the hotel over the city’s cobblestone streets was a lot of daka-daka-daka-daka as our roll-a-boards clattered over them. 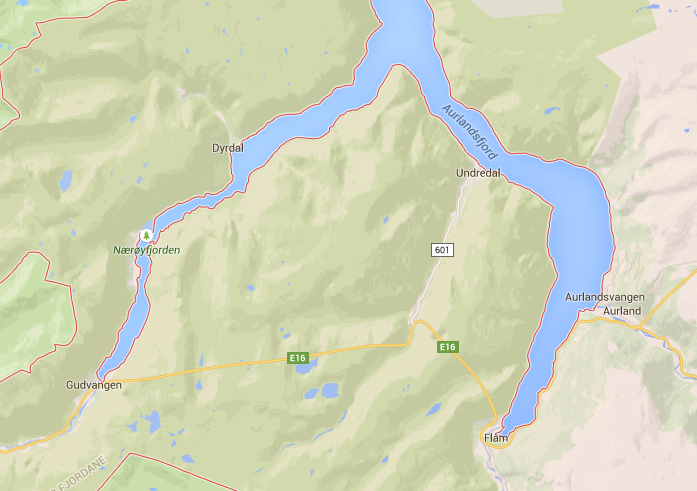 Not exactly roll-a-board friendly, but a walkable distance.